Onchi began printmaking in early 1914, six months before the publication of the first volume of 'Tsukuhae'. 'A face' was created during this earliest period. Although Onchi entered the Preparatory Course for the Western Painting Faculty at the Tokyo School of Fine Arts (now the Tokyo University of Fine Arts and Music) in 1910, the academic training did not suit him (he never finished the art school). Instead, he preferred the company of Takehisa Yumeji (1884-1934), the popular illustrator/ designer. What Onchi found attractive in Yumeji's works which he did not find at the art school was the poetry content in visual imagery. Dispite the strong influence Onchi received from Yumeji, in his works the nature of 'poetry' is drastically altered from the nostalgic sentimentalism of the older artist. This is often explained by two major factors: the first is the image of illness and death which preoccupied Onchi and his two close friends Tanaka and Fujimori who created the magazine 'Tsukuhae'; the second is the Der Sturm exhibition held in March 1914 which included prints by Kandinsky, Marc and other prominent German artists. Onchi was familiar with German, and read Kandinsky. He had also seen woodcuts by Munch at an exhibition earlier. 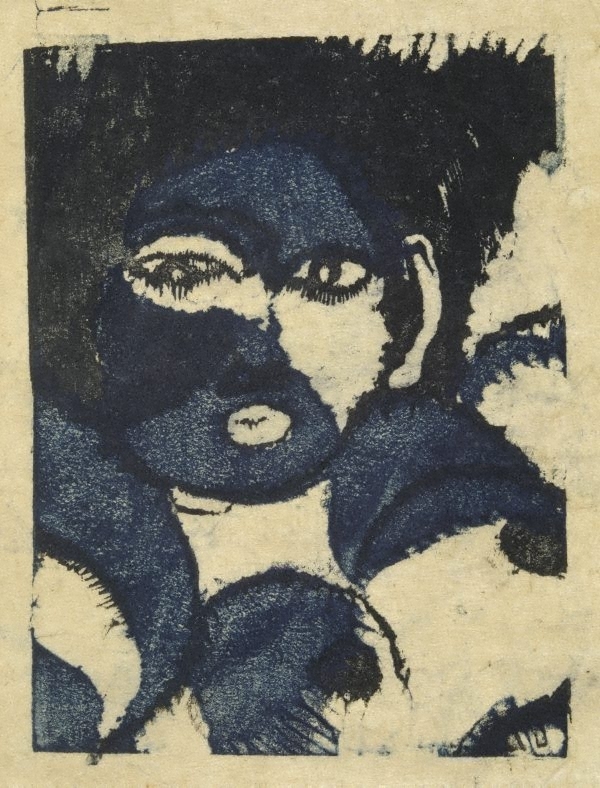 Thus from the very beginning of Onchi's printmaking, he was experimenting in compositions and techniques to visualise intense emotions, and no other artist achieved the level of Onchi in this endeavour. 'A face' is an excellent example of this. The National Museum of Modern Art, Tokyo. 1976. 'Koshiro Onchi and 'Tsukuhae'', Tokyo, cat. no. 71 (monochrome illus.). The Yokohama Museum of Art, the Miyagi Museum of Art, the Museum of Modern Art, Wakayama (eds). 1994. 'Onchi Koshiro: a poet of colours and forms'. Yomiuri Shimbun, Tokyo, pg.36 (colour illust. cat. no. 8). Chiba City Museum of Art. 1999. 'Nihon-no Hanga II 1911-1920: a banquet of carved 'individuals'', Chiba, pg.69 (colour illus. cat. no. 124).